Ideal for large changes in alkalinity levels or daily dosing in aquariums with high pH. 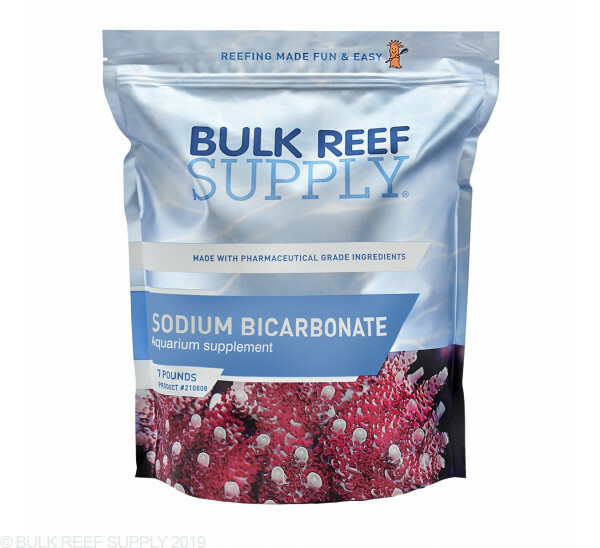 Bulk Pharma Sodium Bicarbonate - Ultra-pure Alkalinity Additive for your Reef Tank! 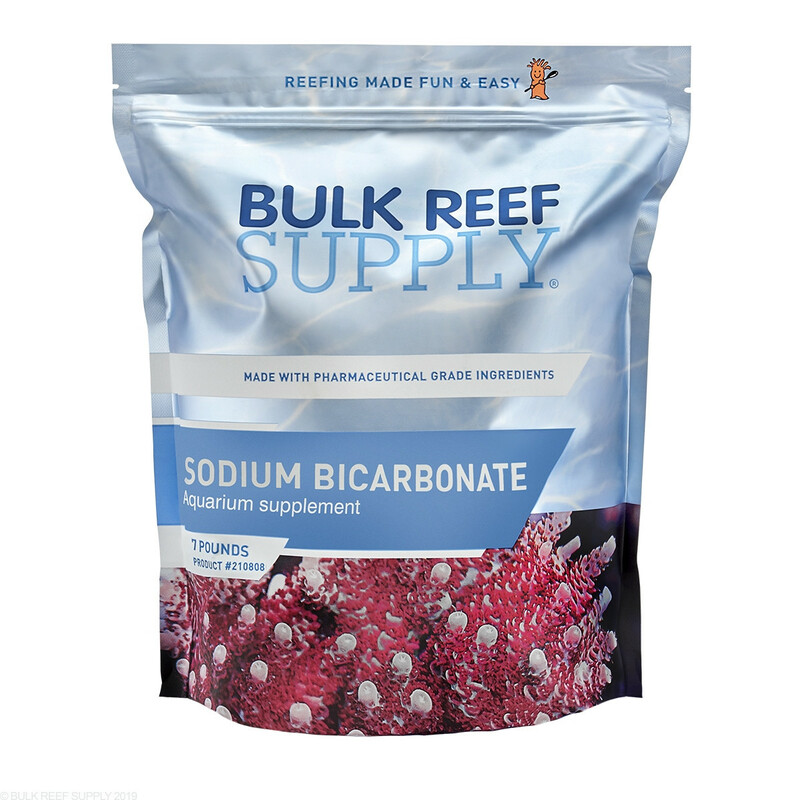 Bulk Reef Supply 2-part additives are the perfect solution to replenish the intake of calcium and alkalinity coral consumes when it grows. Using only pharmaceutical grade ingredients allows you to keep a cleaner reef with fewer impurities, leading to faster growth and more brilliant coloration of your coral. All BRS additives mix crystal clear and do not leave any nasty residues or brown impurities behind like other calcium and alkalinity additives. Fill a 1-gallon container 4/5 full of RO/DI or distilled water and add 1 cup and 2 tablespoons of BRS Pharma Sodium Bicarbonate. Secure the cap on the container and shake it for about 10 seconds to help start the dissolving process. Remove the cap and fill the container the rest of the way with RO/DI or distilled water. Give the container a few more shakes and then let it sit until all the salts have fully dissolved before use. Placing the mixing jug in a bowl of warm water will help decrease the time it takes to dissolve. 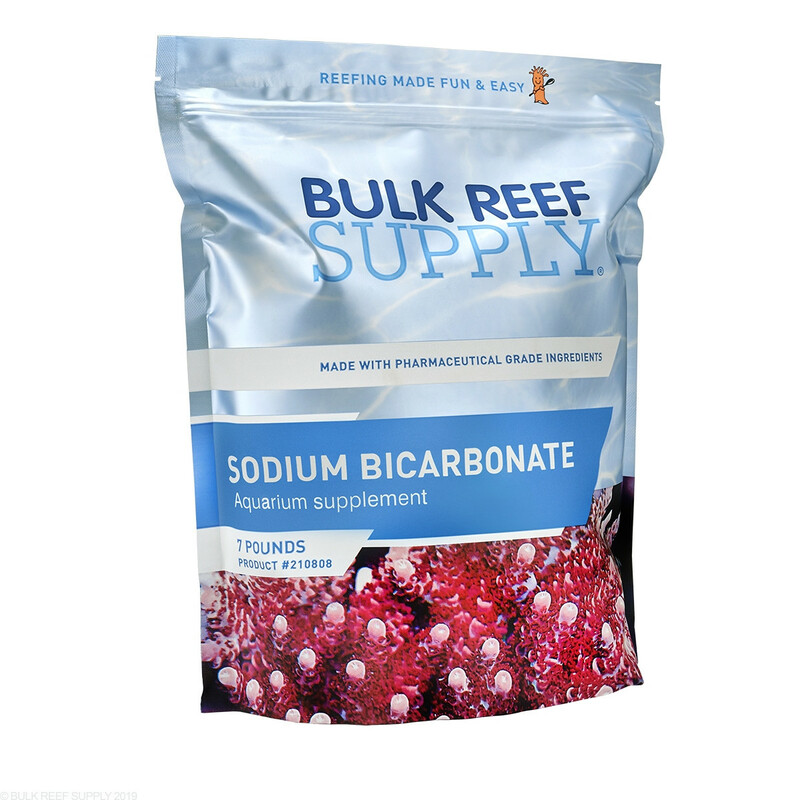 General Alkalinity Adjustments - Create a 1-gallon solution by following the Mixing Instructions above and then test your aquariums current calcium level and using the BRS Reef Calculator input your current and desired alkalinity levels along with your total system water volume. Choose BRS Bicarbonate Liquid Alkalinity (New Pharma Pouch) option from the drop-down menu and select calculate. The result will be how much alkalinity solution you will need to add to raise your aquariums water volume to the desired level. We suggest adding small amounts at a time into a high flow area of the tank, like a power heads output or a sump baffle. It is important to keep changes limited to under 1.4 dKH or less per day to not shock your corals. Tip: If you are having issues raising your alkalinity, check to ensure your aquarium magnesium level is between 1200-1350ppm and that the solution is added to a high flow area of the tank. Step 1. Start by following the General Adjustments instructions above to adjust your aquariums alkalinity, along with calcium and magnesium to your desired levels for your dosing regime starting point. Step 2. Wait 5 days and retest your aquariums alkalinity level and compare the results to your starting point levels to find the difference. The difference between the starting point and the final reading is how much alkalinity will need to be replaced over the course of a 5-day span of time. We recommend testing at the same time of day as alkalinity levels can fluctuate throughout the day. Step 3. Go to the BRS Reef Calculator and input your new desired level and your new current level along with your total system water volume. 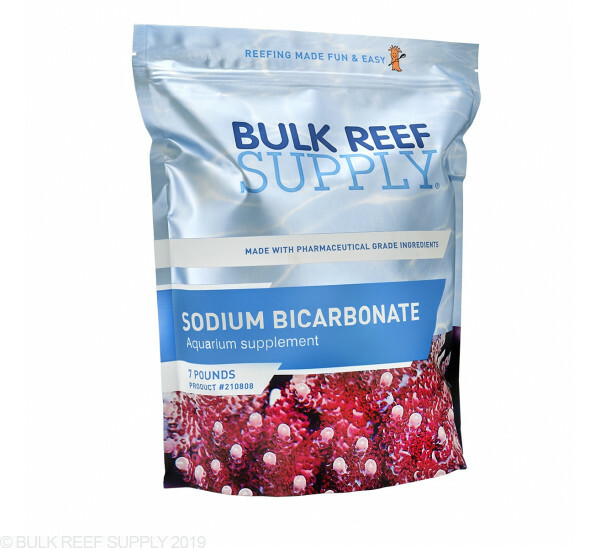 Select the BRS Bicarbonate Liquid Alkalinity (New Pharma Pouch) option and then calculate. That amount will be the total solution needed for a 5-day span of time for your reef tank. To know your daily dose just divide that number by 5 (see example below). Step 4. Replenish your alkalinity by adding the 5-day total to your aquarium and any other diminished levels back to your desired starting point, then wait a few hours before starting your daily dosing regime. Step 5. Monitor and adjust daily dose as necessary. If your alkalinity levels are slowly rising, we suggest subtracting 10% per day until it is stable. If your alkalinity levels are dropping slowly we suggest raising your daily dose by 10% per day. easy to mix, and apply with a doser ect. If your Alk is low and you need to raise up rather than maintain it, use this rather than soda ash. I used this in my saltwater mixing/storage tank that had precipitated down to 7.1 dkh. This raised the alk nicely to 9.0 with no change in PH. It does exactly what it's suppose to do at a good price. I use the sodium bicarbonate opposed to sodium carbonate because it has a lower pH. I dose a lot of Ca(OH)2, so this product increases alkalinity, and stops the pH from increasing too much. Cheapest source of alkalinity out there! Works well, and great price. Great product .... replaced my name-brand bicarbonate with this... easily 1/3-1/2 the price if not better .... you would be foolish not to make the switch. Why just spend money on a big brand when BRS products are all you need and then some for a fraction of the price. Great product. easy to use and works great with Calcium and Magnesium. I have been using this for over a year ant it works great. Just add a dosing pump and life is good! How many gallons will 7 lbs make? The 7 lbs of sodium bicarbonate makes over 12 gallons of BRS Bicarbonate Liquid Alkalinity.